This mirror consists of a highly decorative leaf design with egg & dart decoration with decoratived mounts to each side of the central eglomise panel. This eglomise panel (reverse painted) is a landscape scene of a windmill and houses in the typical Dutch style painted with a green background with gold, white and black tones with spandrels of roses to the top corners. The side supports are cluster columns with Corinthian capitals to the top. 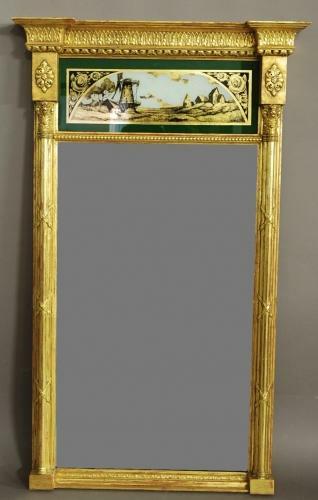 The mirror is in very good condition, the mirror plate is original and also in good condition. The eglomise panel has a very small scratch which can be seen in some lights/angles but is not very noticeable.